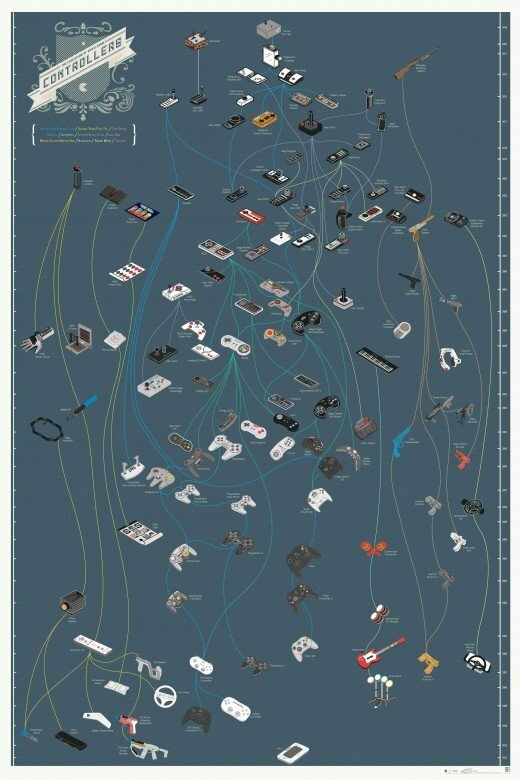 History of game controllers courtesy of Pop Chart Labs via How To Be A Retronaut. All I can say is wow. Oddly, it’s not surprising, really that the game controllers evolution parallels that of art. In many ways, the designer of each controller had to not just consider function, but best how to also incorporate form in order for it to be attractive and desirable to use. Much like a lot of art has the function of being enjoyed, analyzed, critiqued and in general scrutinized, it also had to have a cultural significance, a specific aesthetic. Otherwise, the meaning of the work would be lost. Interesting though, that I can’t tell if this is meant to be sarcastic, ironic, simply enlightening, or maybe something of any and/or all of the above. Perhaps I’m over-tired at the moment. Good post though, as always, thought provoking. Well, I wasn’t necessarily suggesting a direct parallel with art, but as you pointed out whenever form and function come into play there is going to be aesthetic as well as technical evolution. When I saw the game controllers print, I was immediately reminded of Barr’s chart. So I was laying them together with no particular agenda in mind, but when you lay things like this side by side interesting observations, such as yours, sometimes emerge. Ya know what I realized after I made my post, was that it’s funny that the game controllers that look like guns, the one’s you shoot with, and follow the form of working like a gun in a shooting style game environment, are in the precise location where we find the Bauhaus in the art evolution print. The ironic thing about that is that the Bauhaus philosophy is that “form follows function”. Therefore, form is dictated by the function, and it’s just sort of ironic that controllers meant for shooting games would also overlay where their form most closely resembled their function. Just more odd observations. Hopefully I didn’t make you dizzy with that. It does make me wonder if the artists that put together the controller history didn’t study first, the arts history chart. Kinda makes ya go ‘hmmm…’. Sorry, meant to say “it’s just sort of ironic that controllers meant for shooting games would take a form which follows that function, while overlaying the same area where the school listed with that philosophy sits on the arts chart.” I don’t know how that thought got jumbled but it didn’t quite complete while I was typing I guess. Huh, that is interesting. You know, I did wonder whether Barr’s chart was not in the back of the designer’s mind as they work on their chart. Not necessarily I suppose since there are only so many ways you could do a vertical flow chart of this sort, but if I were a betting man I would bet that they’d been thinking about Barr at some point.